Hi Stampers. 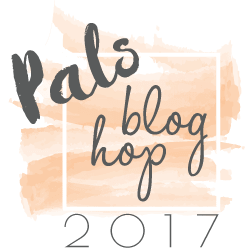 Welcome to the August 2017 Pals Blog Hop. Thank you so much for joining us today. This month we’re going to “Cut It Out”. Participants will feature projects with “cuts” from punches, dies, Framelits, Edgelits, or Thinlits. Here in Northern California we are less than a week away from school starting up, that lets me know that Fall/Autumn is right around the corner. 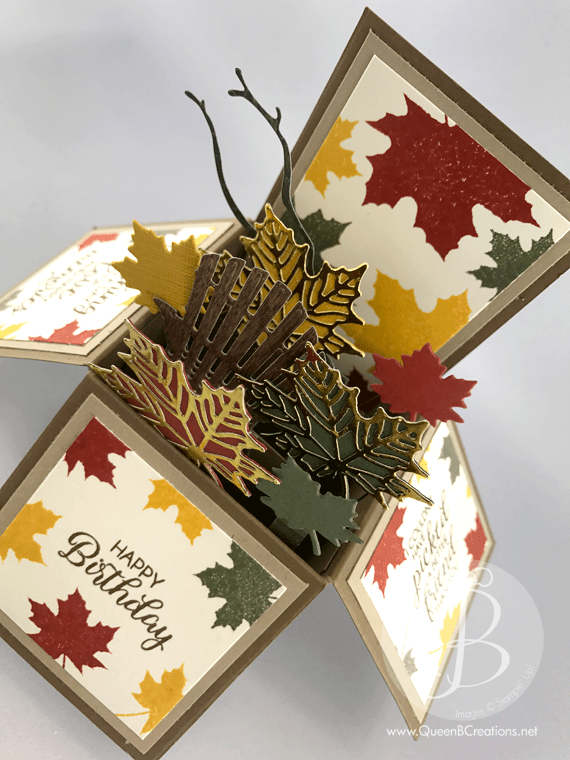 My project for today is a Fall/Autumn themed card in a box birthday card. 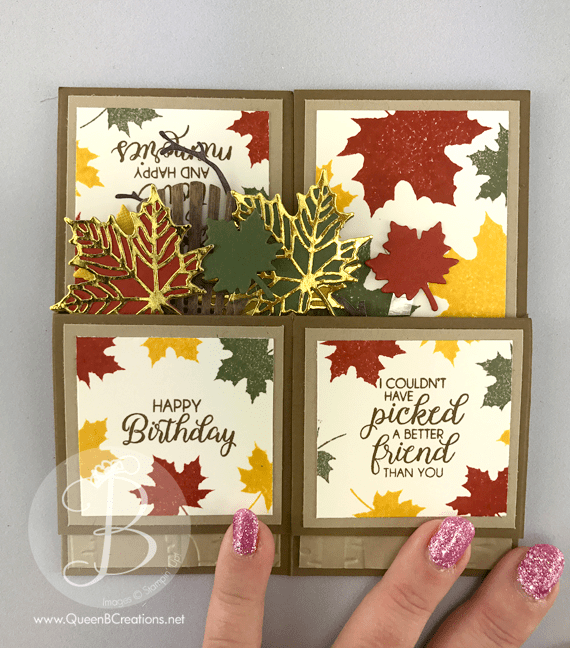 This card features some beautiful fall colors (Cajun Craze, Always Artichoke and Crushed Curry inks paired with Soft Suede, Crumb Cake and Very Vanilla card stocks with a touch of wood textures DSP and gold foil paper). I used my basic card in a box card base design (found here) using Soft Suede card stock with Crumb Cake layered over that. The bottom crumb cake pieces have been dry embossed with the Woodland textured embossing folder on the Big Shot. The flaps are layered with Crumb Cake and then Very Vanilla card stock. Onto the Very Vanilla card stock I have stamped the sentiments from the Beautiful Bouquet stamp set in Soft Suede ink. I then stamped the leaves in Crushed Curry, Always Artichoke and Cajun Craze inks. The leaves were cut out of Crushed Curry, Always Artichoke and Cajun Craze card stock using the Seasonal Layers thinlit dies. The larger leaves have an additional detailed layer of gold foil over the top of the full leaf. The branch and the chair we die cut out of Wood Textures DSP. All these pieces have been attached to the dividers in the middle of the card in a box with 1/4″ strips of acetate and glue dots. The back side of the box has a 2 1/8″ x 5″ layer of Very Vanilla giving plenty of room to stamp a few matching leaves and still leave plenty of room for the giver to write a personal message to the recipient. This card fold flat for mailing and fits into a 6″ x 5.5″ envelope made with DSP using the envelope punch board. These card in a box cards have been very popular in my Etsy store! I encourage you to give it a try! I have listed all the supplies used below. There are links to my store to purchase these items from my store 24/7. If you don’t already have a demonstrator – I’d love to be YOUR Stampin’ Up! lady! What can I say but your ARE THE QUEEN BEE! This is just amazing. I admit, I am super intimidated about making projects like this BUT….I am having a fun day with the girls on Friday and I am going to MAKE THIS! Super fun…..
p.s. – your nails look great!!!! This is perfect! Love the colors and will finally give this box a try! Super card — I love how it looks when it’s folded up, too! Beautiful colors! Absolutely love this! Have followed your directions and made three birthday cards, and they are so pretty. Thank you for the inspiration to step out of my “box” to do this. Ooo, la, la Lisa! What a great Autumn show! Love it. 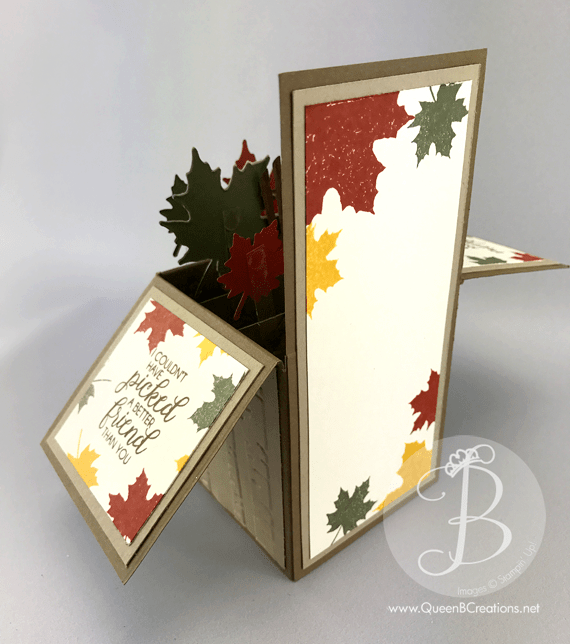 I love the beautiful fall colors and your fun fold card. I made 25 of these for a destination wedding to have in each hotel room. The guests loved them! Lovely box card! Lots of beautiful work. 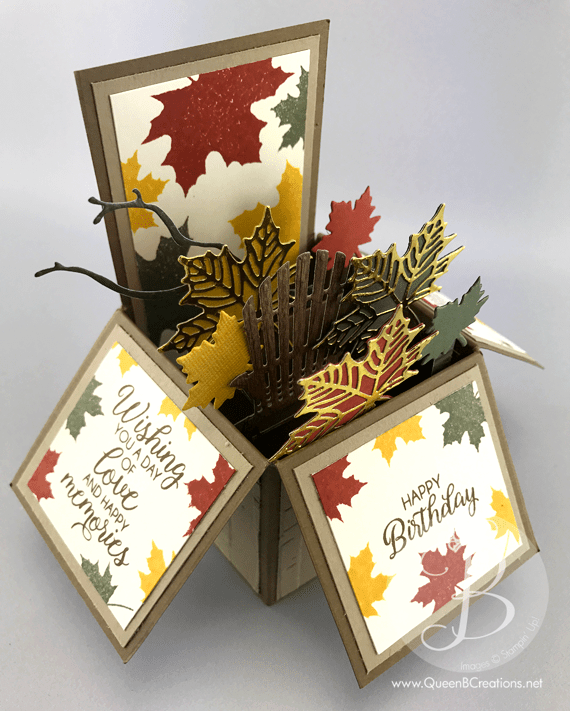 I love you cards in a box and this one is no exception….you’ve captured the colors of fall perfectly! I love the colors and textures and IT’S A BOX!!! Super fun and special. I love a good 3D project and will enjoy following your instructions!